S. N. Eisenstadt is well known for his wide-ranging investigations of modernization, social stratification, revolution, comparative civilization, and political development. This collection of twelve major theoretical essays spans more than forty years of research, to explore systematically the bases of human action and society. Framed by a new introduction and an extensive epilogue, which are themselves important statements about processes of institutional formations and cultural creativity, the essays trace the major developments of contemporary sociological theory and analysis. Examining themes of trust and solidarity among immigrants, youth groups, and generations, and in friendships, kinships, and patron-client relationships, Eisenstadt explores larger questions of social structure and agency, conflict and change, and the reconstitution of the social order. He looks also at political and religious systems, paying particular attention to great historical empires and the major civilizations. 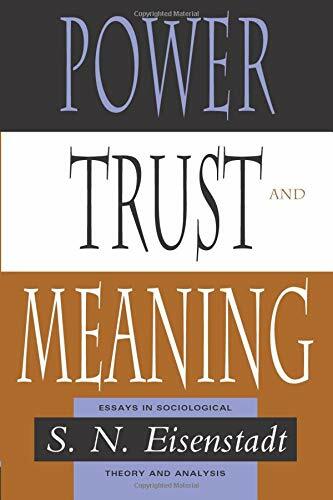 United by what they reveal about three major dimensions of social life—power, trust, and meaning—these essays offer a vision of culture as both a preserving and a transforming aspect of social life, thus providing a new perspective on the relations between culture and social structure.